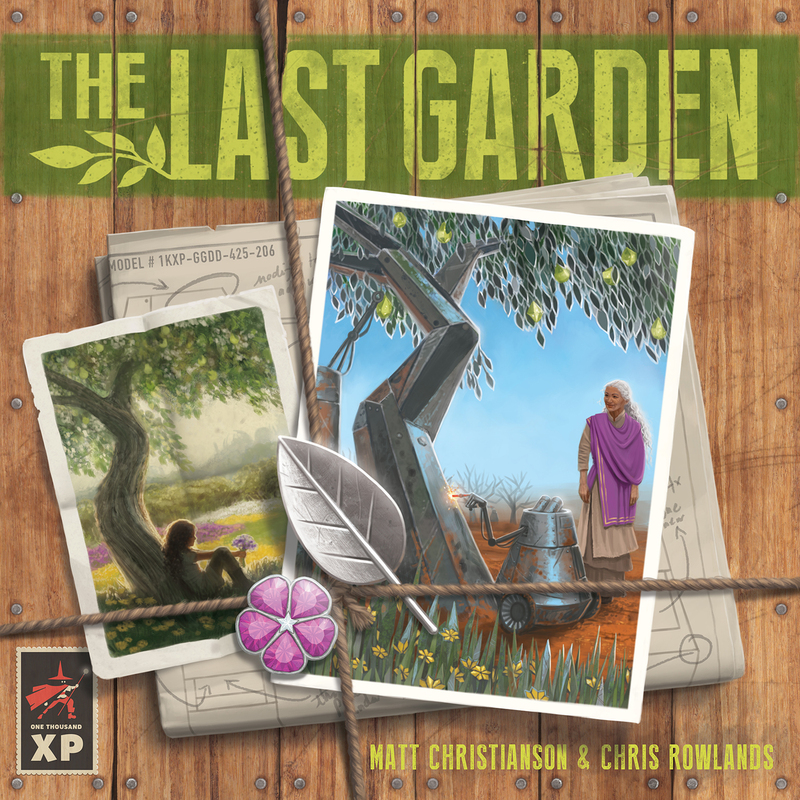 Robotanists constructing artificial gardens in the post-apocalypse. In her travels, The Queen has accumulated a collection of out-of-commission robots. She has reprogrammed them all into Robotanists and will use them to turn metal and rare gems into an elaborate garden. The Robotanist AI isn’t the best, but they’ll try as hard as they can to please their Queen. She doesn’t quite remember exactly what the gardens look like, but she’ll know it when she sees it. Until then, the Robotanists will work the mines, build the garden, and place gems as they all vie to be the Queen’s favorite. The Colorful Queen – The gems are placed and moved like standard colored gems. However, during scoring, each black gem subtracts one point from the area’s total. 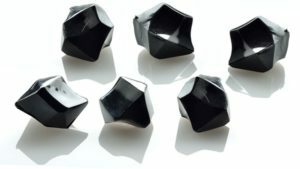 The Weight of Obsidian – The gems are placed like standard gems, however they are heavy and may not be moved. In addition, they remain in an area even if the area wilts. Repulsion Gems – The gems are placed and moved like standard colored gems. However, once a black gem is placed in an area, no other gems may be placed in that area. Remove all black gems from the board at the end of each turn. Rerouting – When this card is played select an area that matches it’s number. You may move one of your Robotanists from a corresponding area into another unoccupied area. Black Energy Spike – When this card is played select an area that matches it’s number. You may remove 2 gems from that area. Implosive Energy – When this card is played select an area that matches it’s number. You may move 1 gem from each area that is adjacent into the corresponding sector. A Little Help- When Zinnia is drawn, immediately discard her and place one gem anywhere into the garden. Draw a card. Zinniawesome – Play Zinnia face up on the table and place 3 gems of the same color on her, taken from the supply. Until the end of the round, each gem of that color counts as 2 for the purposes of scoring. From A to Zinnia- During setup, place Zinnia near the board. Robotanists may be placed on her. When a Robatanist is placed on Aster, take one gem from the supply. At the end of the round, place that gem anywhere you like and then place your Robotanist on a scoring area. Daisy-Do – When Daisy is played, swap the locations of two dice in the garden. 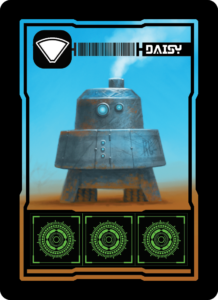 Daisy Dump – When Daisy is drawn, immediately discard her and remove all gems from a sector of your choice. Draw a Card. Daisy Duo – During setup, place Daisy near the board. Each player may place one Robotanist on her during each round. At the end of the round you may move each of your Robotanists on Daisy to any sector that contains exactly one of your opponent’s Robotanists. You will score that sector as well. Robotanists are put on the board in the same order they were placed on Daisy. 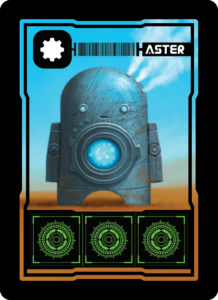 Re-Aster – When Aster is played, you may move one of your Robotanists on the board to a different space currently occupied by one of your other Robotanists. 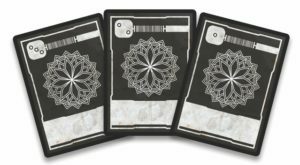 Aster Presents – When Aster is drawn, immediately discard her and place three 1-Favor cogs on three different areas of the garden. The first player to claim those areas adds those cogs to their supply. Draw a card. Asternomical – Each round, place six 1-Favor cogs from the supply onto Aster. 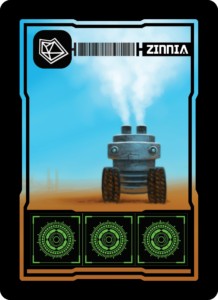 At the end of the round, divide those cogs evenly among all the players who have placed at least one Robotanist on Aster during the round.